Bookstores, do you want your icon here? Contact us. Although there are plenty of publications dealing with the theory of multi-agent systems and agent-based simulations, information about the practical development of such systems is scarce. The aim of this book is to fill this empty space and to provide knowledge about design and development of agent-based simulations in an easy and comprehensible way. The book begins with the fundamentals of multi-agent systems, agent principles and their interaction, and goes on to discuss the philosophy of agent-based programming. Agent-based models – like any other scientific method – have drawbacks and limitations, which are presented in the book as well. The main portion of the text is then devoted to a description of methodology and best practices for the design and development of agent-based simulation software. The methodology (called Agentology) guides the reader through the entire development process, from the formal definition of the problem, through conceptual modeling and the selection of the particular development platform, to the programming and debugging of the code itself and the final assessment of the model. The visual language as the means of representation of the conceptual model is included. The reader is also presented with a comparison of present multi-agent development environments and tools, which could be helpful for the selection of appropriate development instruments. Given that the theoretical foundation is presented in an accessible way and supported by many practical examples, figures, schemes and source codes, this publication is especially suitable as a textbook for introductory graduate-level courses on multi-agent systems and agent-based modeling. Besides appealing to students and the scientific community, the monograph can aid software architects and developers who are not familiar with agent principles, conveying valuable insights into this distinct computer paradigm. The idea of multi-agent systems as a new paradigm of information systems' architecture appeared a couple of decades ago; since then it has been utilized for numerous purposes in the field of robotics, artificial intelligence, distributed information systems and many others. The unique features of multi-agent systems, such as distributedness, redundancy, robustness, and artificial learning, make it an interesting substitute for traditional software systems in certain application domains. The body of publications regarding multi-agent systems is huge and ever-growing in recent years. 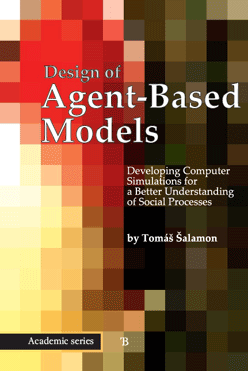 This book addresses one particular chapter of the big multi-agent story: agent-based modeling. Agent-based modeling is a modeling and simulation method where multi-agent systems are used for the representation of social, economic, ecological and other similar systems in a software environment. Multi-agent systems can be very useful for this purpose due to their principal similarities with certain traits of human societies and natural ecosystems. Agent-based simulation can mimic such a society and allow us to perform tests, experiments and forecasts that would not be otherwise possible. Agent-based modeling appears to be a promising technology that has the potential to improve the modeling, forecasting, and experimental abilities in economics, finance and other social sciences and to overcome some drawbacks of the present methods. It may seem that scientific implementations and publications of the method are relatively abundant; however, after a deeper exploration we find that there is a lack of practical applications and a very low awareness of the method in the scientific community. This book aims to help fill this gap and to answer the questions that can emerge when we are involved in the construction of agent-based simulations.